As we traversed the rugged terrain of Lost Maples Natural Area, we caught our first glimpse of Clematis texensis peaking out from the base of limestone outcropping. 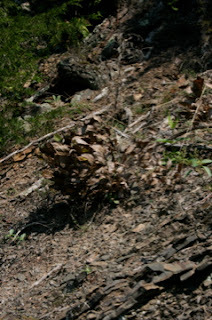 As we moved deeper into the canyon, we found C. texensis growing in boulder bars and scrambling over stunted shrubs. These plants were larger and more floriferous than the plants growing in shade. The brilliant red flowers set this species apart from other Clematis, and have tremendous ornamental value. While there were no seeds ripe at the time, we serendipitously found a local native plant nursery (Natives of Texas Nursery, http://www.nativesoftexas.com/) who was offering seedlings for sale. For those interested in the native plants of Edwards Plateau, I highly recommend this nursery. I was also able to acquire plants of Penstemon triflorus and Phlox villosissima (Phlox pilosa ssp. latisepala). 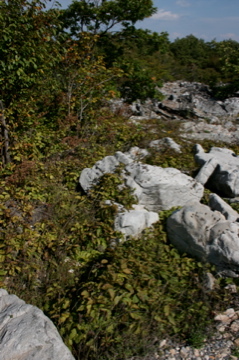 Sometime later during the dog days of late July, I was botanizing in southwestern Kentucky. While looking for the exceedingly rare Phlox pilosa ssp. deamii, we came across the demure Clematis versicolor. The two-tone flowers of this species are less flamboyantly colored than C. texensis, but possess a demure charm unique to North American Clematis species. Fortunately we were able to collect some ripe seeds of this rarely grown plant. As of this weren't enough, an early autumn jaunt to heights of Dolly Sods revealed a single, very large plant of Clematis occidentalis var. occidentalis growing amongst boulders. 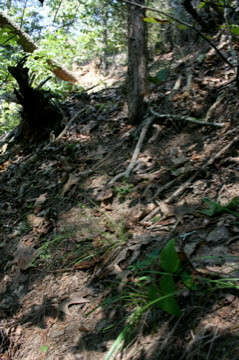 This species was scrambling along the ground, not climbing and of the stunted trees in the area. There were no flowers to be seen, but there was a surfeit of seed, and we were able to collect a pinch. A slightly different perspective showing Clematis occidentalis ssp. 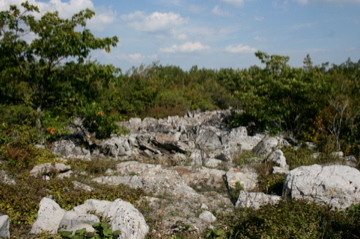 occidentalis near Dolly Sods. On the same trip we also witnessed two Clematis species endemic to the shale barrens of West Virginia and Virginia. These shrubby species are quite rare in the wild and even more rare in cultivation. This is not the greatest photo, but in the lower right corner is growing what appears to be Clematis albicoma or C. coactilis. This clematis was growing in the heavy shade of stunted Pinus virginiana; the seed had already dehisced. 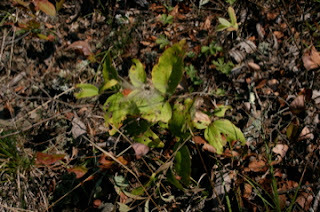 A second Clematis (C albicoma or C. coactilis) grew in more exposed situations in full sun. These plants had more stems and were covered with ripe seed. We collected a small portion of seeds and some of them have already germinated. On a somewhat related note, it is hard to ignore the pronunciation of the word "Clematis", which is frequently the fodder of conversation. Whenever I am asked to weigh in on the subject, I say this, " because its grows upon a lattice, some people call it Clematis, but Mr. Webster won't cease to his until you call its Clematis." Hi I am based in Cambridge England, I found your images and text interesting on Clematis. Have grown many species over the years, including a number of the species from the USA. I believe the main difference between albicoma and coactilis is that coactilis is more hairy, but its stems apear green to white if covered with hairs, whereas albicoma stems are dark brown to black and are less hairy. Thanks for the information Roy. I think the plants I have pictured there are C. coactilis. The stems and leaves are more pubescent than those of C. albicoma plants I recently saw on Kate's Mountain in West Virginia. I was able to germinate many seeds collected from the plants I have pictured and will be studying them closely. What a thrill that must have been to see that clematis texensis growing in the wild!!! !